I found Seamonsters under recommendation from @digitalmaverick and bought both the Wii game and the DVD produced by National Geographic. The DVD is typical of the quality one comes to expect from National Geographic with a mixed timeline of prehistoric marine dinosaurs and the different discoveries of their fossils by archeologists. The game allows the user to access the game as a marine dinosaur and perhaps doesn’t have the elegance of Endless Ocean but it is still an alluring game. 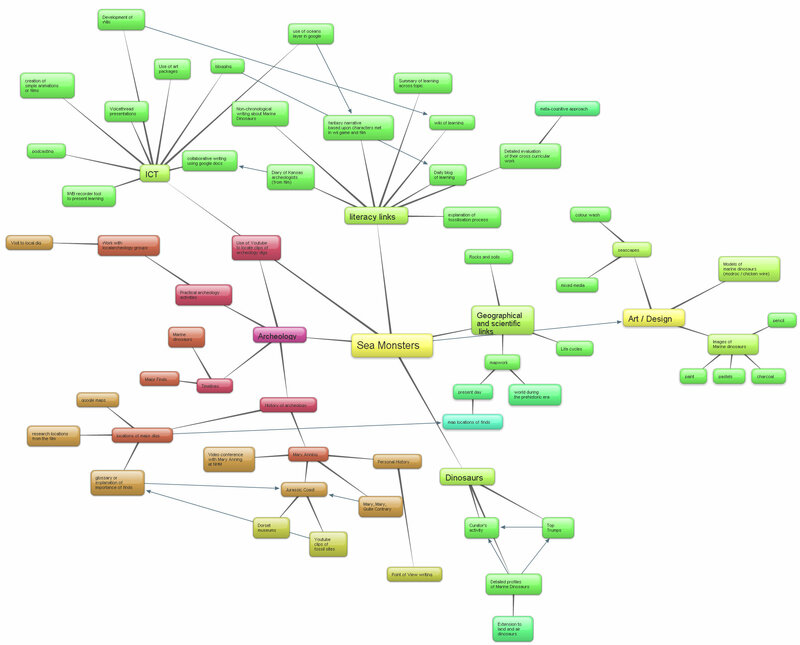 I have drawn up a curriculum map – this is deliberately not demarcated by UK National Curriculum subjects but I think that it will be easy to make the links. I have made links that are slightly Anglo centric with a focus on Mary Anning (she of Mary Mary Quite Contrary fame) who was based on the Jurassic coast to the west of Poole. The DVD also places to investigate across the globe including Holland, the USA and Australia. This is hopefully a starting point and I would love to hear any comments which may inspire further developments. Would you think of adding a literature component – Jules Vern? Myths and legends about sea-monsters? Investigate the monsters and traditions in Pirates of the Caribbean? Will look forward to hearing how you get on with this in your class. Just one more thing – do you know if wii games bought in the UK will work in Australian wiis? I bought a heap of wii games in USA but they don’t work here – region code I believe. Thanks for those excellent ideas. I love the idea of bringing in the myths and legends as children could try to make links between them and the marine dinosaurs. They could even develop myths around some of those on the DVD. I am not sure about the wii game situation but let’s stick it on Twitter and see if we can find the answer! There is a book Fossil Girl by Charlotte Brighton which is a picture book about Mary Anning with the pictures formatted like comics. Might link to use of Comic Life to retell a time line for dinosaurs or the jurassic coast. You can also use the fossil as a portal to take you to another world which makes me think of The Garden by Sheldon and Blyth. I think the Kraken is a sea monster so how about The Kraken by Gary Crew and Marc McBride – dark and scary but very good. I didn’t know about Fossil Girl and The Kraken so that’s another order from Amazon. Thanks for these Joy they will take the topic much further on. Do you know The Mystery of the Eilean Mor by Gary Crew? It is one of my current favourites! The Natural History Museum do a videoconference with Mary Anning for schools so it would be great to develop her history as a theme. Eilean Mor is a new one to me so that’s more spending at amazon for me too! I quite often recommend Gary Crew as an author to study. The Water Tower makes it onto my top 10 list of picture books although it is probably out of print now. Amazon are currently stocking it, albeit at a rather high price!